It's wonderful to see these beautiful red roses. Lovely! Our log is a rede rose! I love the rose, it was beautiful. Sorry to see it died, but hey, more will come. Roses! A rose is a rose is a rose. So lovely, so red. So many different and beautiful shades of red. Great photos. I loved looking at them. How beautiful, and all the more so for it's swiftly fleeting nature. Summer Stock Sunday starts May 31st - come check it out! red roses are always lovely to me! That is a perfect rose...even in its demise! There will be more! Hi S.T, this is a very pretty RED rose that you found for today. I liked your 'contradictions' poem by Radici a lot too, it fits and help make my day. Oh that I could have this said about me! Happy RT, thank you for your visit and for leaving your nice comment. I will continue the European Holiday theme for RT and for SkyLooking. I will try to make a map for it by next post. Beautiful roses! Love the flower collages. My Mr. Lincoln is just putting on new growth. Our winter was long and deep...and hard on my roses. I have Mr. Lincoln by my Barbara Bush rose (keep the Republicans together) My John Kennedy is on the other side of the garden. ;-D.
Love the visual story you have presented here of the life cycle of this lovely rose. 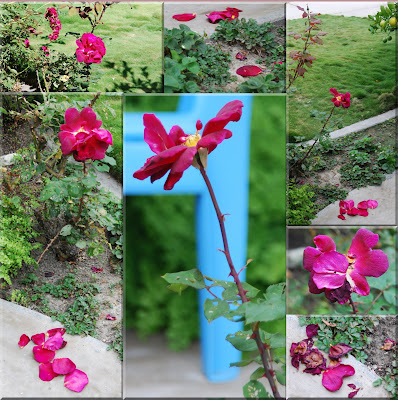 Good idea to catch the life of a single rose in collages. 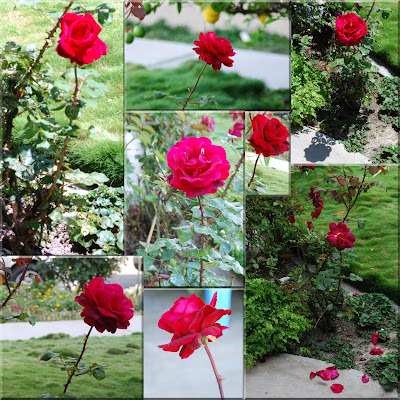 My yard just won't support roses, so I'm always happy to see others' photos! Just wanted to stop by and say 'hi' as it has been a while since I visited you. 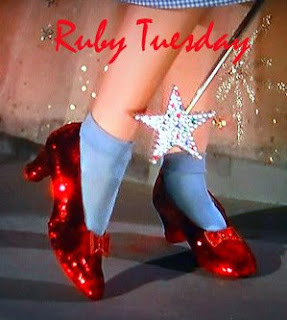 I hope your are having a good week so far. Ah ! red roses ! so romantic ! Dome things are as beautiful in their passing as in their first bloom. These flowers are so pretty & you always arrange your collages so nicely! Prayers are needed, swing by my page for details, please! I loved the rose pictures! Thanks for visiting me recently! Neat idea to capture the life of a single red rose.